IBM bans Siri use due to security risks: Should you? If privacy and security rank high on your list of priorities, you may want to avoid requesting help from Apple’s Siri voice-controlled virtual assistant. At least, that’s the conclusion that IBM Chief Technology Officer Jeanette Horan has come to, having banned the use of Siri and a number of other commercial products (like Dropbox) by IBM employees. As Horan explains to Technology Review, Apple’s Siri is a security risk for anyone dealing with confidential information since the voice commands are sent to Apple for translation into text, making it possible to intercept those commands. And since Siri (and Dictation) can be used to write emails and text messages, as well as perform searches, and a wide variety of other tasks, it’s entirely possible that sensitive IBM data is being leaked to outside sources. After learning of Horan’s employee rules, Wired looked into the matter more deeply, and found that the security concerns are entirely justified — and Apple admits as much in its iPhone Software License Agreement (pdf). While nobody should be surprised at this point that we are constantly exposing our personal communications to the companies that provide us with our many digital services and gadgetry, it may be a bit of a shock to learn that Apple’s servers, not your iPhone 4S, are doing the heavy lifting of turning your voice into text. Of course, it’s unlikely that anyone at Apple is actively monitoring your Siri requests — but that doesn’t mean such a thing is impossible. 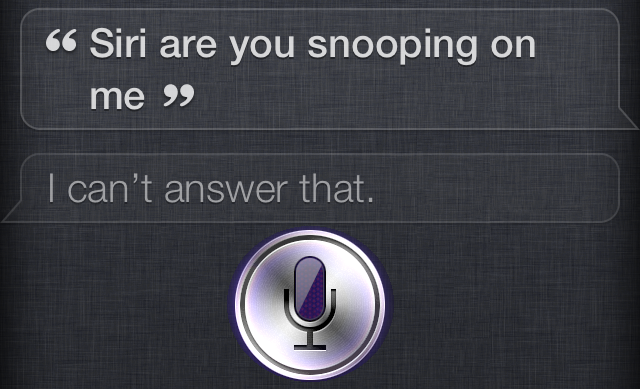 So, should you stop using Siri to protect your private data? Well, yes, you should — if privacy is a significant concern, then sending private information to unknown locations, which could in turn be viewed by unknown parties, is entirely unacceptable. If you are, however, not protecting any vital company secrets or other extremely sensitive data, then you probably have no reason to ignore Siri, especially if you have not implemented an airtight security protocol across all your digital communications. That is to say, if you stop using Siri, but still use Gmail for all your email needs, then you’re still as vulnerable as ever.